Gallery Rejects, Part 1: Switching Concepts. Hey everyone! First of all, I want to say, it's a huge distinction for me to be invited to the show I am going to promote here. I don't want this post to be taken in any negative way whatsoever, rather just to highlight and analyze a problem you might come across as an artist. Back in September I was contacted by Palm Avenue Fine Art in Sarasota Florida to participate in the American Masters Invitational Show. Although I wasn't so familiar with the gallery itself, I am definitely familiar with the other names invited to participate in the exhibition. Names such as Jeremy Mann, Ron Hicks, Paul G. Oxborough, Brent Cotton, Kevin Beilfuss, Joseph Paquet, and many more should be enough to pique your interest as it did mine. I was very eager to create something new that would make an impact on a new scene and within such prestigious company. I decided to get back into this Natural Patterns series once again. It's something I've been wanting to do for a while anyway, and I think a good complement to the Painted Roses series I'm also producing plenty of. So I decided to give it a shot and send them this image for their consideration. "Parhelia" 30x24 in. oil on linen. 2014. A few days later, I got an email from them saying that while they admire my other work, they did not feel like it would sell in the area. They then requested a new painting from me. I grumbled about it for a bit but then got back to work. Time to submit for the show was running out, so it was important to start on the right foot this time. I got an idea of what they wanted from me, which was more along the lines of my painting, "Jaquenetta." So I got creative with my reference and came up with something that I could get excited about painting. They loved it! So it will be getting sent out soon to them. I can't wait. The take-away? Rejection is always possible, no matter what stage of the game you're in, or how good you think your painting is. How will you take it? If you're given another shot, just think of it as a second try to create an even better painting than before. If you don't succeed again, then it is probably not a good fit of a gallery for both of you. And it's also not to say that it wouldn't be a good fit for a different gallery either. 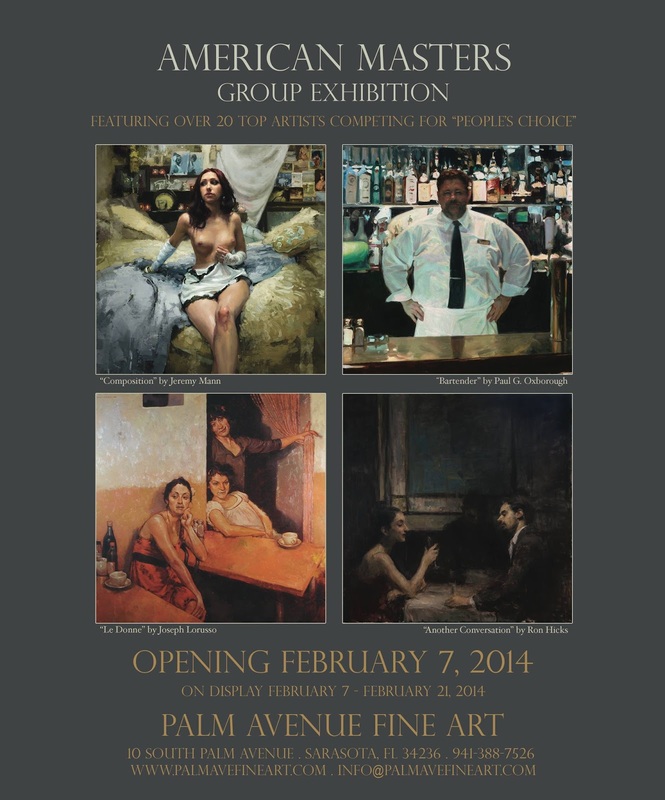 On display February 7 - 21, 2014. Check out some of the other paintings for the show at their Facebook page. It's the new year, which means you will inevitably see a lot of blogs and articles about goal-setting. I have a confession: I've never been big about goal-setting in any concrete way. Especially not New Year's Resolutions. I think the easiest way to fail at a New Year's Resolution is to call it a New Year's Resolution. They are usually vague, and not very well-planned out. I've reached a point however, where I think I need to gather up some smarts I've picked up along the way and use some mental tools if I hope to reach the next level of my career. So often when I read an article about goal-setting, it is explained in abstract terms. Why is this? Is it because the author is trying to connect with the broadest audience? Nothing wrong with that, but I am going to be very specific in my plan here for two reasons. One, I think for those people that this post helps, it will help much more than a vague post about goal-setting in general. Two, my putting this out into the world will motivate me much more to stay the course... If I start slacking, the only thing I will be thinking is how some of you will think, "Hey wasn't Sergio supposed to be trying to keep on his goal? I knew he couldn't do it. Oh well. What a loser." I can't have that. What is my goal for 2014? It is a financial one, and has everything to do with my art business. Financial Goal: $45,000 in gross profit from art sales. To figure out what I need to do to achieve this goal, I had to crunch some numbers. I've been getting better at keeping records of what I do, the more I do this whole art biz thing, so I have the numbers to figure this out. 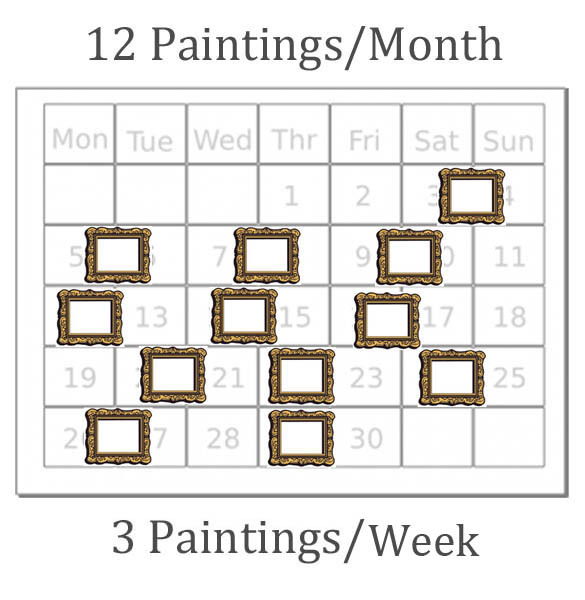 I had to figure out first how many paintings I sold this year, and for how much. I then divided this number into something I can easily wrap my head around. 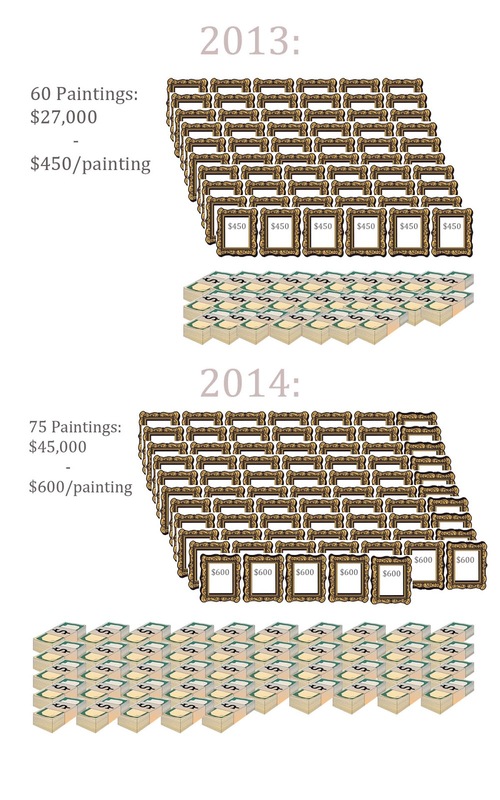 In 2013 I sold about 60 paintings at a total gain of something close to $27,000. This averaged out to about $450 a painting. To make $45,000 I can sell 60 paintings again, for $750 a painting, or perhaps a better way, I can sell 75 paintings for $600 a painting. I don't plan on raising my prices, so this means I need to paint and sell more larger pieces. More than half of the paintings I sold were 8x10"and smaller, which make me $300 or less each if I sell them in galleries. This means I should start painting a lot more 11x14"s and 12x16"s. You can't sell what you don't paint, after all. On average, I sold 5 paintings a month in 2013. Sometimes I sold way more, sometimes I sold less. Since I sell close to half of the paintings I actually put out there for sale(I think? 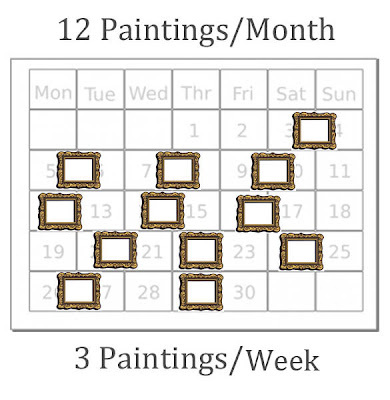 ), I have to paint at least 12 a month to have a chance to sell 6 a month. Painting this much will inevitably make me improve, so hopefully that average will raise up a bit! Also, that's only about 3 paintings a week. As a full-time artist, I'm in big trouble if I can't manage to do that. Besides, the numbers say I already paint about 10 a month, so what's another 2? These numbers give me a lot of flexibility. If I want to, I can paint 6 to 8 small plein air paintings one week, work 2 or 3 of them into larger pieces the next week, and start on a couple of larger studio pieces the next. Paintings done for gallery shows also count for these numbers of course, and will also guide me in the directions I need to go to be able to fulfill the gallery obligations and my own expectations at the same time. Breaking it down from such an abstract goal of "sell more art this year" into an actual number to strive for, then dividing that into manageable chunks, not only makes it feasible for me, but actually comforts me to know that the math adds up. Even in my art I'm a big fan of form and structure, so I guess it makes sense for me to seek that in other aspects of my life.